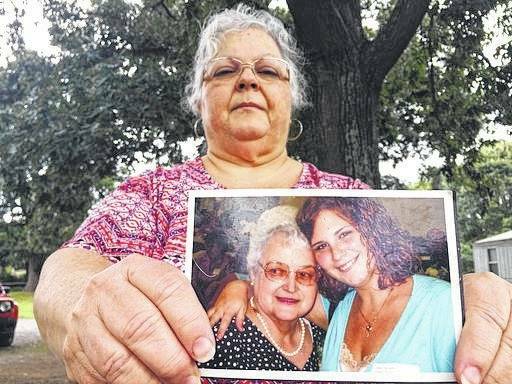 Susan Bro, the mother of Heather Heyer, holds a photo of Bro’s mother and her daughter on Monday in Charlottesville, Va. Heyer was killed Saturday when police say a man plowed his car into a group of demonstrators protesting the white nationalist rally. Bro said that she is going to bare her soul to fight for the cause that her daughter died for. CHARLOTTESVILLE, Va. — An Ohio man accused of ramming his car into a crowd of protesters at a white nationalist rally in Virginia will remain in jail — at least until he has an attorney. Judge Robert Downer declined to set bond at a hearing Monday for James Alex Fields Jr., who faces second-degree murder and other charges, until he has legal representation. The judge says the public defenders’ office informed him it could not represent Fields because a relative of someone in the office was injured in Saturday’s protest. Downer said Charles Weber, a local attorney, will be appointed to represent the 20-year-old Fields. The next scheduled court hearing is Aug. 25, though Fields’ attorney could request a bond hearing before then. Fields was not physically present in the courtroom but appeared via a video monitor. He was seated and wearing a black and white striped uniform. He answered questions from the judge with simple responses of “Yes, sir” when asked if he understood the judge. He told the judge, “No, sir” when asked if he had ties to the community of Charlottesville. Fields is charged in the death of Heather Heyer, 32, of Charlottesville. She died when Fields allegedly slammed his car amid a crowd of people protesting the white nationalist rally Saturday. Fields was arrested shortly after and has been in custody ever since. Fields was fascinated with Nazism, idolized Adolf Hitler, and had been singled out by school officials in the 9th grade for his “deeply held, radical” convictions on race, a former high school teacher said Sunday. He also confided that he had been diagnosed with schizophrenia when he was younger and had been prescribed an anti-psychotic medication, Derek Weimer said in an interview with The Associated Press. Police say Fields drove his silver Dodge Challenger through a crowd of protesters in Charlottesville, killing Heyer and wounding 19 other people. A Virginia State Police helicopter deployed in a large-scale police response to the violence then crashed into the woods outside of town and both troopers on board died.